Learn how to make suncatchers? Here you can purchase an entire kit containing crystals, beads, accessories and full instructions to make your own suncatchers. We have many assorted suncatcher kits available, you will learn how to make butterfly and charm suncatchers at the beginner level then advance onto cluster and spiral suncatchers at the advanced levels. New crystal kits will be added regularly to this category so keep coming back to see what is new. 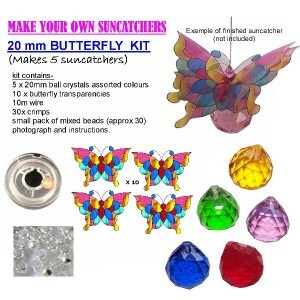 20MM CRYSTAL BUTTERFLY SUNCATCHER KIT. Level- beginner Learn to make your own gorgeous crystal s.. 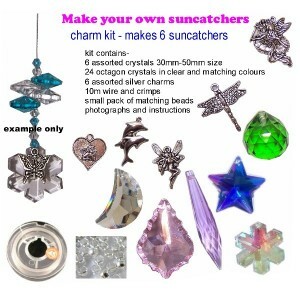 CHARM SUNCATCHER KIT. Level- beginner Learn to make your own gorgeous crystal suncatcher gifts. 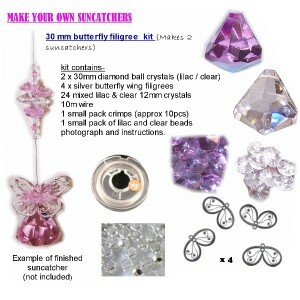 ..
30MM DIAMOND BALL BUTTERFLY SUNCATCHER KIT. Level- medium Learn to make your own gorgeous.. 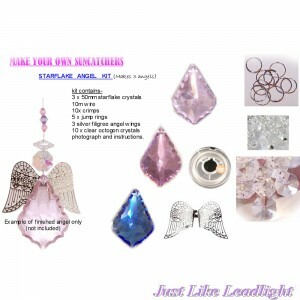 This is a Suncatcher kit to make your very own pretty angel suncatcher hangings. This kit contain..